Report on Business Cannabis Professional Tracking legalization in the U.S.
Cannabis Professional is continually updating developments at the U.S. state and federal level. Click on any of the state links below for more recent news. This CanPro tracker also archives everything we’ve published, serving as a permanent record of these historic developments. Most Americans live in states where marijuana is legally available in some form. But most financial institutions don't want anything to do with money from the cannabis industry for fear it could expose them to legal trouble since the federal government still considers marijuana illegal. The conflict between state and federal law has left businesses in California's emerging legal pot industry in a legal dilemma, shutting many out of everyday services such as opening a bank account or obtaining a credit card. It also has forced many businesses to operate only in cash — sometimes vast amounts — making them ripe targets for crime. An Assembly bill would authorize state regulators to share detailed sales, cultivation and shipping information collected from cannabis companies with banks, a step supporters hope will provide additional assurances to financial institutions that a pot shop or grower is operating within the law. But most banks don't see those rules as a shield against charges that could include aiding drug trafficking. And they say the rules are difficult to follow, in effect placing the burden on banks to determine if a pot business is complying with all legal rules. The number of banks and credit unions willing to handle pot money is growing — it's over 400 across the United Statest — but they still represent only a small fraction of the industry. 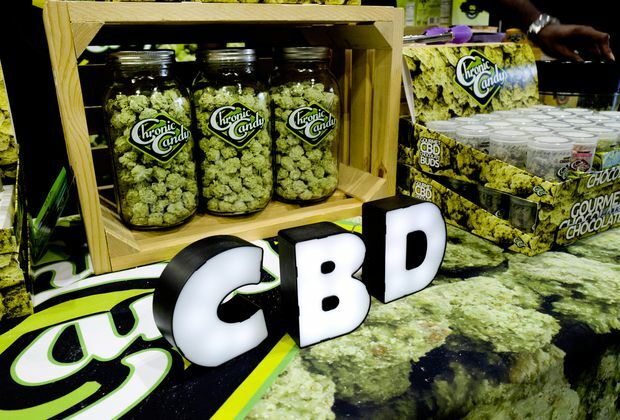 U.S. regulators say they’re exploring ways CBD could be used legally in foods and dietary supplements, and will hold a public hearing on the cannabis compound next month. File photo CBD buds of chocolate. The U.S. Food and Drug Administration says the May 31 meeting will discuss the science, manufacturing and sale of CBD as it explores regulation of the ingredient. A U.S. congressional panel advanced legislation Thursday that would allow banks to provide services to cannabis companies in states where it is legal. While all but three states allow for some form of legal cannabis use, marijuana is still illegal on the federal level. That has left banks largely unwilling to do business with businesses that sell marijuana or related enterprises, out of concern they could run afoul of federal laws. In particular, banks are wary that taking deposits from pot businesses while marijuana remains illegal at the federal level could violate anti-money laundering laws, which in turn could put at risk their federal charters or access to federal payments systems. A growing majority of Americans say marijuana should be legal according to the General Social Survey, a widely respected trend survey that has been measuring support for legal marijuana since the 1970s. Support for legal marijuana hit 61 per cent in 2018, up from 57 per cent in 2016. Analysis shows that support is across all age groups and political parties. 54 per cent of Republicans and 76 per cent of Democrats favour legalization. 65 and older: 46 percent say marijuana should be legal (up from 42 percent in 2016). Views on marijuana legalization have shifted dramatically: in 1973, 19 per cent supported legalization. The change in views about cannabis can also be witnessed on the campaign trail. A growing list of Democratic presidential contenders, including Kamala Harris and Cory Booker, want the U.S. government to legalize marijuana. Support for legal pot has increased sharply since 2012, when Colorado and Washington state became the first states to legalize the recreational use of cannabis. Statewide rules governing onsite use of marijuana at authorized stores take effect April 11 in Alaska. A joint is prepared at the medical marijuana dispensary in Anchorage, Alaska. Some in Alaska’s legal marijuana industry have said it’s possible that the first onsite use areas could be approved by this summer. Interested retail businesses will have to apply for a special onsite use endorsement, devise plans meeting security, ventilation and other standards and gain approval of the regulatory Marijuana Control Board. The rules allow local governments to protest onsite consumption endorsements and by ordinance or a vote of the people prohibit onsite use or aspects of it, such as smoking. Lt. Gov. Kevin Meyer on Tuesday signed and filed the regulations, the last step before they take effect. 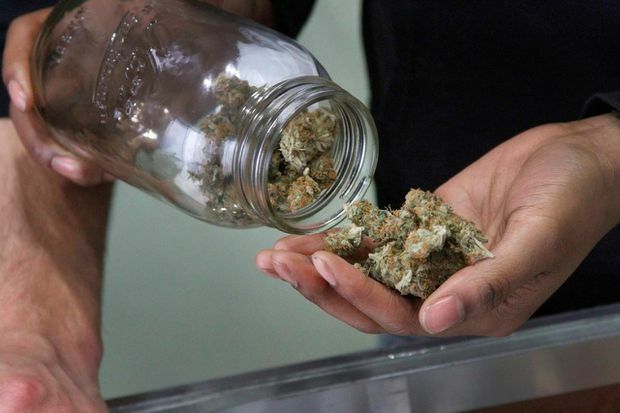 Medical marijuana sales in Arkansas are set to begin around May 12 as cultivators plan to begin harvesting the plant in the coming days and regulators finish the approval process for the state’s first dispensaries. Department of Finance and Administration Spokesman Scott Hardin said the final decision for licensing Doctor’s Orders RX in Hot Springs, which would be the state’s first operational dispensary, will be made within the next two weeks. The dispensary has been inspected by both the Alcoholic Beverage Control, which regulates medical marijuana, and the fire marshal and is awaiting final approval. Three of the five licensed cultivators have begun growing, Hardin said, with Bold Team in Cotton Plant expecting to have their first harvest ready to be sold by May 12. Bold Team's cultivators expect to have about 200 pounds of product dried and cured for an initial harvest, spokesman Robert Lercher says. Two other cultivators, Natural State Medicinals Cultivation in White Hall and Osage Creek Cultivation in Berryville, have also begun growing, Hardin said, and both expect to have their first harvest by summer. Hardin said the final two cultivators have broken ground and are constructing facilities. With around 10,500 Arkansas residents licensed for medical marijuana use — and 40,000 expected when all licenses are issued — but only one cultivator ready to harvest, many are concerned that the initial supply might not meet demand. “My biggest concern is that there’s going to be shortages right off the bat,” David Couch, the attorney who wrote the medical marijuana amendment Arkansas voters approved in 2016, said. “They’re going to run out of product and people are going to be disappointed and back to zero again,” he said. Plaintiffs include: Santa Cruz County, Agoura Hills, Angels Camp, Arcadia, Atwater, Beverly Hills, Covina, Ceres, Clovis, Dixon and Downey, McFarland, Newman, Oakdale, Palmdale, Patterson, Riverbank, Riverside, San Pablo, Sonora, Tehachapi, Temecula, Tracy, Turlock and Vacaville. Los Angeles is considering a major crackdown on illegal marijuana shops that have been bedeviling the city's legal marketplace. Mayor Eric Garcetti said Wednesday said he is considering adding “tens of millions” of dollars to the fight against the flourishing illicit market. He says legal shops “can’t get undercut every single day” by illicit sellers who typically have lower prices. California kicked off broad legal sales in 2018, but Los Angeles has struggled to get control of its vast illegal marijuana economy. LA is the largest U.S. city with a legal pot market. California brought in considerably less in tax revenue from cannabis sales than analysts had forecast when the market was legalized, the Orange County Record reported. California booked US$345.2-million in tax revenue from legal cannabis during the first year of regulated sales in 2018, according to numbers released by the state. Revenue figures are on track to match the forecast revenues in the current fiscal year. Governor Ned Lamont remains optimistic Connecticut lawmakers will pass legislation legalizing the recreational use of marijuana, despite opposition from four state medical society presidents. The Democrat said Tuesday it would be "irresponsible and dangerous" to leave marijuana sales to "the black market." He says legalizing marijuana "on a carefully regulated basis is the safest way" for Connecticut to proceed. Lawmakers plan to merge several bills that detail a potential legalized system into one bill for the full General Assembly to consider this session. The presidents of the Connecticut, Delaware, New Jersey and New York medical societies recently signed a letter expressing opposition to marijuana legalization efforts in their states, saying "not enough research has been done to prove marijuana is safe." House Democrats unveiled a package of legislation to legalize recreational marijuana. The plan would allow marijuana to be cultivated, manufactured and sold to consumers in Connecticut. Proposals are also included to tax the drug and clear criminal records of low-level drug offenders. Cannabis seedlings grow under lights. One bill creates a pilot program for marijuana sales to adults over 21, beginning the end of 2019. The drafts don’t allow people to grow their own marijuana; legalization would be modeled after Connecticut’s existing, tightly regulated medical marijuana program. Potential tax revenue: Estimated to be $30-million to $180-million annually. Less than a month after Florida lifted a ban on smokable medical marijuana, a state House committee approved a bill to limit the strength of marijuana flowers available to patients who want to smoke their medicine. The House Health and Human Services Committee voted Wednesday to cap THC levels in smokable medical marijuana at 10 per cent over the objection of patient advocates who said stronger marijuana is already on the market and limiting strength will hurt patients and boost black market pot sales. Republicans supported the cap and Democrats opposed it. More than 200,000 patients have medical marijuana identification cards, though smokable forms of the plant only became available last month. Voters approved medical marijuana in 2016, but the Legislature placed a ban on smoking it. That ended when Governor Ron DeSantis signed a bill ending the ban, which had been ruled unconstitutional by a judge. The bill backed by the Senate Agriculture Committee would authorize creation of a state program to administer and oversee the growing of hemp. Still, growing hemp for individual use would be prohibited under the Senate bill. Florida’s ban on the use of smokable medical marijuana by eligible patients was repealing Monday. 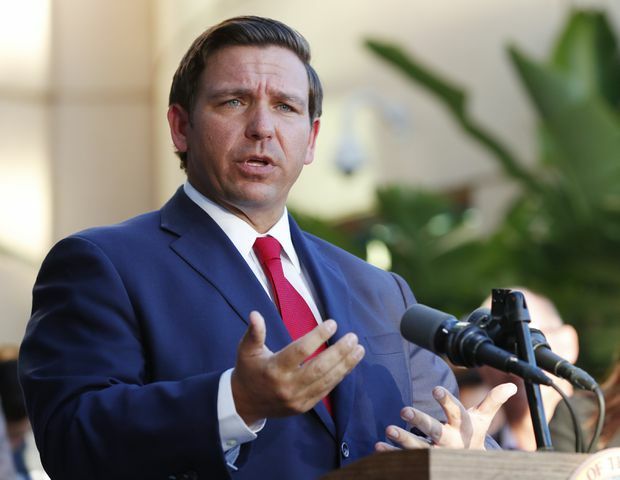 Republican Governor Ron DeSantis announced the state is dropping its previous appeal of court rulings that also could have ended the ban without state lawmakers’ input. Smoking medical marijuana would not be available to anyone under 18 unless the patient is terminally ill and if two doctors, one of them a pediatrician, say it is the most effective form of treatment. It could not be smoked in public or at private businesses subject to the state’s cigarette smoking ban. Florida Gov. Ron DeSantis speaks in Fort Lauderdale. The Florida Legislature met Republican Governor Ron DeSantis’ deadline to hand him a bill to repeal the state’s ban on smokable medical marijuana when the House passed the legislation Wednesday. Governor DeSantis said in late January that the current law doesn’t represent the will of the voters and that he would drop the appeal if lawmakers didn’t repeal the ban by mid-March. A bill that would allow the in-state production and sale of low-potency medical marijuana oil has passed the Georgia senate, two days after the proposal was limited significantly in committee. The Senate voted 44-8 to pass the measure. Its author said there were "many, many problems" with the updated measure. Patients and families advocating for the bill agree. Critics worry that legalizing medical marijuana could lead to legalizing recreational marijuana, which Gravley disputes. Despite garnering widespread bipartisan earlier this year, efforts to legalize recreational cannabis now appears to have stalled. Senate Bill 686, which would allow licensed medical cannabis dispensaries to sell for recreational purposes, passed a committee vote unanimously. A member of the committee said it is “probably too late” for the bill. Another proposal, House Bill 1383, would replace criminal penalties for marijuana possession with fines, and is expected to pass one final committee vote this week before proceeding to a vote on the House floor. The House has voted to kill Idaho hemp legislation after the Senate added amendments lawmakers say turned it into a decision to create a state plan for hemp rather than go with a federal plan yet to be released. The original bill was intended to allow hemp-loaded trucks to cross Idaho — where hemp is illegal. Legislation that will allow the interstate transport of hemp and a hemp-derived extract called CBD through Idaho — where it’s illegal — has been introduced. Hemp backers say the state needs to pass legislation that conforms with federal law on hemp while maintaining the state’s prohibition on marijuana. The state Senate will consider legislation to legalize hemp that Idaho Governor Brad Little said Monday could get his signature if amendments sought by law enforcement officials are approved. The legislation would legalize the growing and selling of hemp products containing 0.3 percent or less of THC, the cannabis compound that gives marijuana its high. Backers say the state's climate is ideal for growing hemp that could produce millions of dollars in revenue for Idaho farmers. Opponents say legalizing hemp could make it more difficult to enforce the state's prohibition against marijuana. Hemp is a crop that comes from the same family of plants that produces marijuana, and determining the THC levels of the plants, opponents say, can be time-consuming and expensive. "In order to preserve our primacy for how hemp would be regulated in our state, we really need to do something this session," she said. Illinois is inching closer to introducing legislation to permit recreational marijuana for consumers age 21 and over. Residents would be able to to buy and possess up to 30 grams of cannabis. Nonresidents would be able to buy 15 grams. Use of the drug in public would be prohibited. A grower cares for marijuana plants. A pair of state lawmakers behind the legislation say about 800,000 people in the state consume pot regularly, but only about 42,000 are registered in Illinois’ medical marijuana program. Louisiana’s agriculture department and a state-sanctioned medical marijuana grower have broken through one of the key regulatory logjams keeping therapeutic cannabis off pharmaceutical shelves and out of patients’ hands. 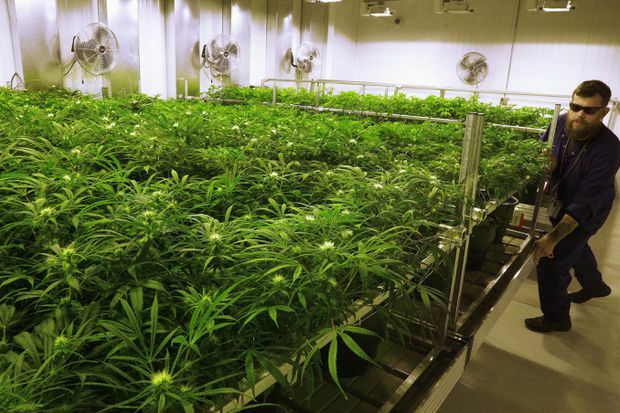 Agriculture Commissioner Mike Strain announced Friday that regulatory paperwork and background checks have been finished that will allow Louisiana State University’s medical marijuana grower to move fully into a larger growing facility and start ramping up production. Still, product testing and other regulatory hurdles remain to be completed — and growing must expand — before medicinal-grade pot can reach patients eligible for treatment of chronic conditions. Maine's proposed rules about the sale of marijuana for recreational use would for the first two years limit licenses to residents of the state. The state released its long-awaited draft rules about the recreational marijuana program late Monday. Residents voted in favor of legalizing marijuana in 2016, but crafting the rules has been a long and sometimes contentious process. The draft states Maine will only give licenses to grow and sell marijuana to people who have lived in the Pine Tree State and filed income tax returns there for four years. That standard would apply until June 2021. The draft rules are subject to public comment and face state approvals. Maine already has a long-established medical marijuana program. It's also currently legal to grow marijuana for personal recreational use there. Maine’s governor has signed a bill designed to make clear that production and sale of hemp-derived food products are allowable in the state. Democratic representative Craig Hickman introduced the bill earlier this year after guidance from state regulators to retailers to stop sales of food products containing the hemp derivative cannabidiol, or CBD. Hickman’s bill is intended to align the definition of hemp in state law with the definition included in the most recent federal Farm Bill. The Farm Bill makes clear hemp is not marijuana. The Maine House of Representatives and Senate overwhelmingly approved Hickman’s bill. Democratic Gov. Janet Mills signed it as emergency legislation on Wednesday. She says it will preserve “the continued growth of the legal hemp industry” in Maine. CBD products do not need to be pulled from store shelves in Maine, officials with the Maine Department of Agriculture conceded. The FDA caused uncertainty in late 2018 by issuing warnings to dozens of companies selling CBD products, claiming despite the passage of the federal Farm Bill that such products still violated FDA regulations. Maine is considering a new state law that would allow it to write its own hemp-based food rules. The House voted 102-4 Thursday in favor of legislation that would prevent unlicensed facilities that stay open after June 1 from becoming licensed for a year. The move comes after a judge last month issued a temporary restraining order blocking enforcement of a March 31 deadline that had been set by state regulators who are more tightly regulating the medical marijuana industry under a 2016 law. The legislation was sent to the Senate for consideration next. The House voted the same day that Court of Claims Judge Stephen Borrello heard arguments in several consolidated lawsuits against the state. He is expected to rule soon. Some suits were filed by temporary operators wanting to stay open after alleging their license applications were denied for invalid reasons. Others were brought by licensed businesses saying they cannot compete against unlicensed facilities that do not have to play by the same rules. Licensing deadlines have been extended numerous times over the last year due to court action and other reasons, including regulators needing more time to thoroughly evaluate potential licensees and concerns about a shortage of marijuana for patients. In March, Democratic Governor Gretchen Whitmer eliminated the marijuana licensing board and folded its functions into a newly created agency, citing "inefficiencies." A bill approved 102-4 by the state House on Thursday will next be considered by the Senate. The measure would prevent unlicensed marijuana facilities that remain open from becoming licensed for a year. State regulators let many provisioning centers reopen temporarily through March without it being a risk to their licensure. But a judge last month blocked enforcement of the March 31 deadline. The sponsor, Republican representative Jim Lilly of Ottawa County's Park Township, says his bill clarifies "that there's a point in time at which we have to move from an unregulated market to regulated, from unlicensed operators to licensed operators." State officials have tried to impose a deadline for licensure since September 2018, but it's been pushed back multiple times due to legal challenges and official intervention. A Minnesota Senate committee voted to kill a bill to legalize recreational marijuana in the state; it’s unlikely legislation will pass this year. The panel also rejected forming a task force to conduct a comprehensive study and come back with recommendations on marijuana-related issues. The bill would have set up a regulatory system for recreational marijuana in 2022; and allowed people previously convicted of marijuana crimes to get their records expunged. Under the bill, it would remain illegal for marijuana to be sold to — or used by — people younger than 21. Missouri plans to license more than 300 medical marijuana-related businesses this year, and is preparing for up to 180,000 people applying for medical marijuana cards. The state is already planning at least 192 dispensaries, 60 cultivation facilities, 86 manufacturing facilities and two testing facilities. More than 450 potential licensees have applied, even though it’ll be months before licenses are awarded and application fees are non-refundable. Sales will begin: January, 2020. The state is still formulating rules and regulations. 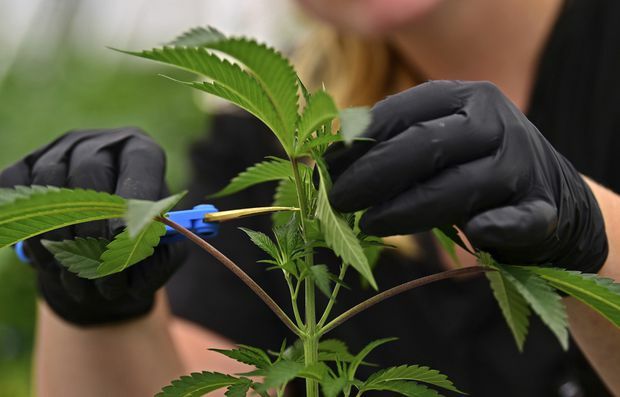 An employee at a medical marijuana cultivator works on topping a marijuana plant. Voters overwhelmingly approved a state constitutional amendment in November allowing medical marijuana use. Backers of an effort to legalize medical marijuana in Nebraska have filed formal paperwork for a statewide ballot campaign. State Senators Anna Wishart and Adam Morfeld. 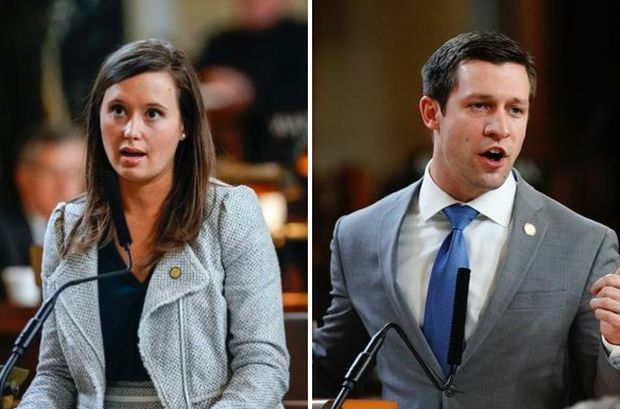 State Senators Anna Wishart and Adam Morfeld, of Lincoln, are co-chairing the effort to place the constitutional amendment on the 2020 ballot. Wishart introduced a bill allowing lawmakers to legalize the drug for medicinal purposes. A Nevada judge says she'll hear arguments next month on a bid by dozens of companies to freeze a second wave of licenses for entry in to the state's lucrative marijuana sales market. Judge Elizabeth Gonzalez told more than a dozen lawyers Monday she can't officially consolidate seven lawsuits filed in Clark County District Court in Las Vegas. Gonzalez says she also has no jurisdiction over two other lawsuits filed in Washoe and Lyon counties. But she says she hopes having most take part in one hearing May 24 will avoid ending up with conflicting rulings by different judges. Companies are accusing state tax officials of failing to disclose how they chose winners and losers last December from 462 applicants for 61 new cannabis dispensary and production licenses. Governor Steve Sisolak on Friday acknowledged "the frustrations of many marijuana license applicants with the current licensing process" and endorsed the legislation that he said "would shed light on the methodology used ... in granting licenses." In the first year after broad marijuana sales began in July 2017, 61 dispensaries statewide reported nearly $425-million in recreational pot sales. Medical marijuana sales totaled an additional $105-million. Nevada reaped $42.5-million in taxes on adult sales, with about $27.5-million going to an account for schools. In the last six months of 2018, all dispensaries reported $884-million in sales and the state took in almost $72-million in taxes on recreational sales, Plaskon said. There are now 65 marijuana stores statewide. A new Nevada bill seeks to create a process for licensing banks and credit unions that would serve marijuana dispensaries. The bill aims to provide those dispensaries with a “safe and efficient way” to invest in the economy and pay taxes. The measure asserts that most marijuana businesses are forced to operate almost entirely in cash because banks are reluctant to serve them as customers. It says the reluctance stems from marijuana still being illegal under federal law. Accounts from the licensed banks and credit unions under the bill would not be required to be insured by the Federal Deposit Insurance Corporation. The bill also creates an advisory board to assess the implementation and enforcement of the legislation. Nevada legislative auditors report that poor bookkeeping processes and a lack of oversight of the legal marijuana industry suggest the state is losing potential tax revenue. Data from many cultivators’ and dispensaries’ tax returns didn’t match with inventory tracking data. $70 million of marijuana excise taxes were collected during the 2018 fiscal year. A sampling of returns suggested “a potential unpaid tax liability of over $500,000” during a six-month period. The department plans to make changes recommended by auditors. The New Hampshire House has given preliminary approval to a bill legalizing recreational marijuana. Lawmakers voted 209-147 in favour of the bill that would legalize up to 28 grams of recreational marijuana and 5 grams of concentrated cannabis. A cannabis control commission would be established to license and regulate cannabis businesses. A similar bill passed the House last year before dying in the state Senate. Democrats, who added legalization to their party platform last year, now control both chambers. Republican Gov. Chris Sununu has promised to veto the bill if it passes. The bill lawmakers voted on contained many of the same details Governor Phil Murphy announced recently, including a $42 per-ounce tax. The bill also includes the ability for towns to impose taxes of up to 3 per cent in some cases. The legislation goes next to the floor in both chambers, but it’s unclear whether there are enough votes for the measure to succeed and make it to the Governor’s desk. Gov. 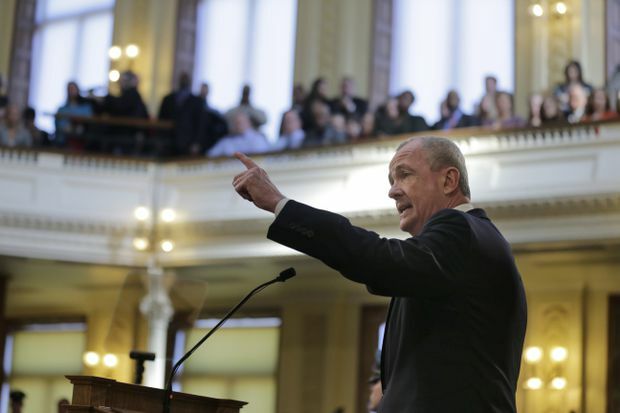 Phil Murphy speaks during a joint meeting of the Democratic-led Assembly and Senate in Trenton, N.J., Tuesday, March 5, 2019. Governor Murphy and legislative leaders said they’ve agreed on legislation to legalize recreational marijuana for adults after more than a year of negotiations. The measure aims at getting cannabis industry participation for minorities and women, the leaders said. The deal calls for a US$42 per ounce tax on the product. It also lets towns collect 3 per cent tax: those with cultivators will collect 2 per cent and those with wholesalers would get 1 per cent. The Assembly is expecting a committee vote on the deal on Monday. A floor vote is possible March 25. Governor Grisham on Monday signed a bill that establishes a state regulatory framework for an emerging hemp industry. State oversight responsibilities are spread across the departments of agriculture, health and environment. Aims to help farmers and manufacturers comply with federal and state law as they develop products including hemp textiles and hemp-derived cannabidiol. Allows federally recognized Native American communities to develop their own regulations and licensing procedures. New Mexico’s Governor said next year’s limited 30-day legislative session will include marijuana reform proposals. In New Mexico, the governor decides what major policy issues are heard during abbreviated legislative sessions in even-numbered years. Governor Grisham says legalization is possible with sufficient precautions to prevent child use and impaired driving. A previous proposal received bipartisan support, but stalled without a Senate vote. New Mexico Gov. 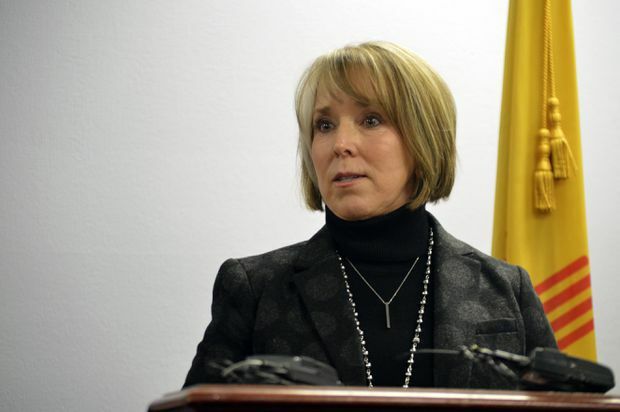 Michelle Lujan Grisham speaks at a press conference in Albuquerque, N.M. on Monday, Jan 7, 2019. New Mexico would become the first U.S. state to set up its own government-operated marijuana stores and subsidize medical cannabis for the poor under a bill brokered between Republicans and Democrats. The Democratic governor has expressed guarded support for recreational marijuana. A 17 per cent tax on recreational marijuana sales would be levied. Possession of up to 28 grams would be permitted. Local governments can opt out, forgoing tax proceeds in the process. Businesses could maintain “zero-tolerance” policies for drug testing as a condition of employment. New Mexico’s House approved a bill that would allow state-run stores and require customers to carry a receipt with their cannabis or face penalties. The narrowly approved measure mixes major provisions of a Republican-backed Senate bill that emphasizes aggressive regulation with a draft by Democrats concerned about the U.S. war on drugs. The bill now moves to the Democratic-controlled state Senate for consideration. Possession of up to 28 grams by people 21 and older would be legal with a receipt. 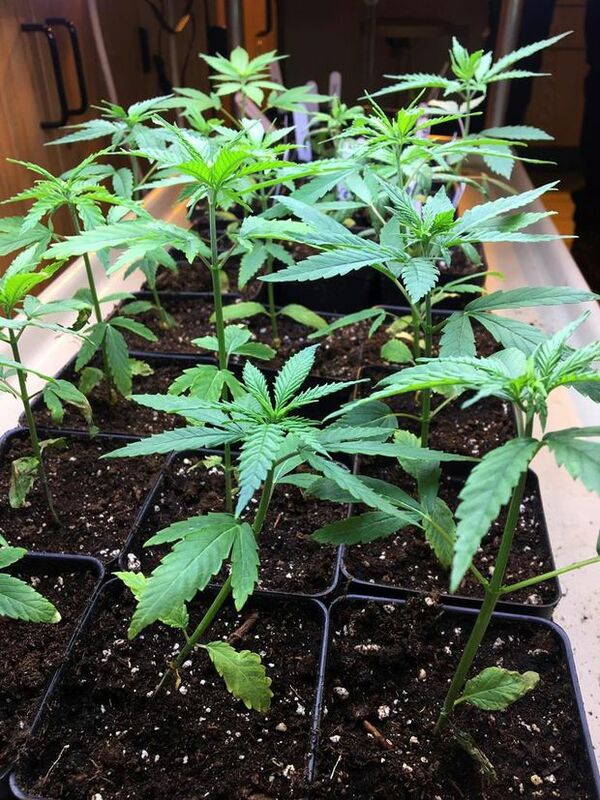 Home-grown cannabis is not allowed. Private dispensaries would be allowed where there is no state-run marijuana store within 25 miles. Oversight of the industry would be shared by state agriculture, health and environmental officials. Taxes: medical marijuana taxes would be eliminated; recreational marijuana sales would be taxed up to 17 per cent. Recreational cannabis stores would open for business in July, 2020. The state’s full House of Representatives will vote on whether to legalize recreational cannabis. House Bill 356 passed the Judiciary Committee, the second approval at the committee level which clears the way for a House vote. Residents 21 and older to possess up to 56 grams of dried cannabis flower. A 17 per cent tax would be imposed. 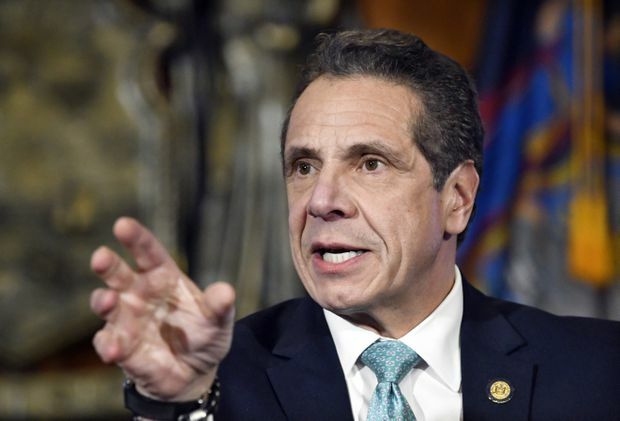 Governor Cuomo said he remains confident the Legislature can vote to legalize adult-use cannabis as part of the state budget, which is due on April 1. New York Gov. Andrew Cuomo speaks at a press conference. Both Cuomo and Assembly Speaker Carl Heastie support legalization. However, there is not yet an agreement on details, such as tax rates and rules about how the product should be sold and regulated. Attaching legalization to the budget is one way Cuomo has used to get leverage over the Legislature. Removing the issue from the budget could complicate the negotiations over legalization, and potentially delay passage. North Dakota’s first medical marijuana dispensary opened for business Friday, two years after voters approved medical marijuana in 2016. The cash-only shop does only carries smokeable versions of the drug. Patients will eventually be able to buy products in six forms: dried leaves and flowers, concentrates, tinctures, capsules, topicals and transdermal patches. Edibles were part of the original initiative but the state Legislature removed them from the list. A House bill introduced in the current session would return them to the menu. State law limits the amount of THC, the chemical that produces a high, in the capsule, patch and topical forms, and it requires patients to get special authorization from a health care provider for dried leaves and flowers with a THC concentration greater than 6 percent. That form is not available to minors. In 2017, the Legislature crafted rules that allow the use of medical marijuana for 17 qualifying health conditions, along with terminal illnesses. State lawmakers this year are considering expanding the list of legal conditions to 30. The Health Department hopes to have dispensaries operating in the state’s eight major cities by fall. Recreational: Illegal (but decriminalized for possession of up to 100 grams). The Ohio Senate has unanimously passed a bill to legalize hemp and hemp-derived cannabidiol oil, a move that could create an industrial hemp industry in the state. Cultivation of hemp as long as it contains less than 0.3 percent THC is allowed. "It's imperative that Ohio moves quickly so our farmers can take advantage of a domestic hemp marketplace to catch up with other neighboring states," Republican Sen. Brian Hill, who also co-sponsored the bill, told The Blade of Toledo. Oklahoma tax officials say medical marijuana sales topped $12-million last month, marking the sixth straight month of explosive growth for the new industry. The Oklahoma Tax Commission reported the state collected more than $870,000 in March from the 7-per-cent excise tax on marijuana. The state collected an additional $1.2-million in state and local sales tax on medical pot in March. The number of patients also is skyrocketing. The Oklahoma Medical Marijuana Authority says it has issued more than 83,000 patient licenses since August. It has also licensed more than 1,200 dispensaries and 2,300 commercial growers. Oklahoma’s booming new medical marijuana industry will have some new state regulations to follow under a “unity bill” that is now headed to the Governor Kevin Stitt’s desk. Guidelines for inventory testing and tracking, advertising, packaging and labelling are established. Employers may fire medical marijuana users in certain “safety-sensitive jobs” who test positive for the drug. The bill isn’t intended to curb the explosive growth of the medical marijuana industry. In this Feb. 4, 2019, photo, Oklahoma Gov. 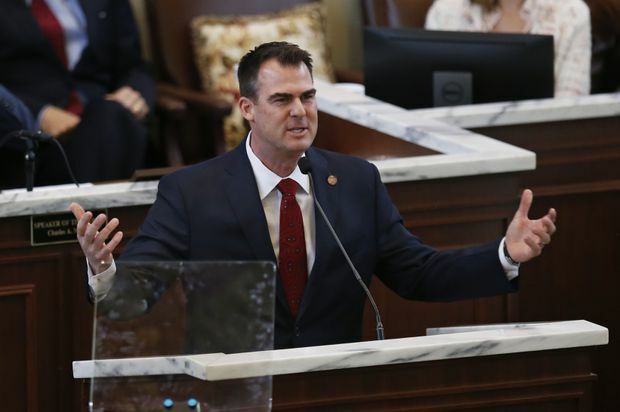 Kevin Stitt gestures as he delivers his State of the State address in Oklahoma City. Numbers from the Oklahoma Tax Commission show medical marijuana sales topped US$4.3-million in January, a fourfold increase from the previous month. The 7 per cent tax on medical marijuana sales generated US$305,265 for the state in January. That figure doesn’t include the standard sales tax that varies from city to city. The Oklahoma Medical Marijuana Authority also has generated more than US$13 million in licensing fees. Nearly 44,000 Oklahoma patients, 950 dispensaries and 1,600 growers have been licensed since August. The proposal responds to a rampant oversupply of marijuana that’s caused prices to plummet. Local policymakers consider a new law, State Senate Bill 582, that would allow marijuana produced legally in the state to be exported to any adjoining jurisdictions that also have legal cannabis markets. Commerce between Oregon and California, Washington and Nevada would be allowed. However, transporting marijuana across state lines remains a federal crime and that no state-level law can alter that fact. Local politicians are struggling to find ways of dealing with the state’s massive cannabis oversupply issues as official data shows more than 1.1 million kilograms were harvested in October, 2018, and wholesale prices have been cut in half over the past two years. Pennsylvania state Senators Daylin Leach and Sharif Street said Monday they will introduce legislation that would legalize recreational cannabis for adult use in Pennsylvania. The bill is expected to face a difficult ride through the GOP-controlled legislature. Governor Tom Wolf says his administration will take a serious look at the pros and cons of marijuana legalization. The state is currently receiving comments from residents as part of a listening tour currently being conducted by Lt. Gov. John Fetterman. A 2017 poll by Franklin & Marshall college said nearly 60 percent of state residents support legalizing marijuana. Anyone over the age of 21 could consume cannabis. Individuals would be able to grow up to six plants for personal consumption. State regulators say sales of medical marijuana in Rhode Island are continuing to hit new highs. Regulator Norman Birenbaum says Rhode Island’s three medical marijuana dispensaries are on pace to sell about US$56-million worth of medicinal pot in fiscal 2019. The Providence Journal reports it is a 46.6 per cent increase over sales in fiscal year 2018. The list of qualifying conditions to enter the medical marijuana program is short but broad, listing symptoms like severe pain or muscle spasms. Birenbaum says regulators remain concerned there are ways to "abuse the program." Last year, Democratic Governor Gina Raimondo's attempt to restrict certain doctors from participating in the program failed. Regulators predict they will collect over US$5-million in taxes on medical marijuana in the current fiscal year. A state legislator is proposing an alternative plan to legalize recreational marijuana in Rhode Island. The proposal sponsored by Democratic Rep. Scott Slater was initially scheduled to be heard Tuesday before the House Judiciary Committee. The Providence Journal reports a group of licensed pot cultivators objected to parts of the bill Monday, resulting in Slater delaying the bill’s hearing for reworking. Owners of the states’ three medical-marijuana dispensaries would be able to create a separate for-profit entity for legalized marijuana production. Opponents say the language of the proposal could help create an unfair advantage in the marijuana business for medical marijuana dispensary owners and stakeholders. Democratic Governor Gina Raimondo proposed legalizing recreational pot as part of her budget proposal. The Rhode Island Senate Finance and Judiciary committees have held their first joint hearing on a proposal to legalize recreational marijuana. The Providence Journal reports lawmakers had several criticisms about the proposal unveiled Tuesday, including that it provides too little money for drug-abuse prevention. Other lawmakers questioned the cost of new positions for a cannabis regulatory commission and said some proposed penalties were overly excessive. Governor Gina Raimondo included potentially legalizing recreational marijuana as part of her budget for the next fiscal year. Her proposal would ban home growing and bar high-potency products from store shelves. Recreational marijuana sales could start by next January if approved. Senate President Dominick Ruggerio says he has significant concerns about the proposal, including work force issues and its impact on children. Some South Carolina faith leaders are showing their support for the Compassionate Care Act, which would legalize medicinal marijuana for individuals with terminal, debilitating medical conditions. The legislation introduced in the House and Senate has bipartisan backing. Patients would be able to purchase up to 57 grams of marijuana or its equivalent every two weeks if authorized by their doctor. People angry about sweeping changes made to a voter-approved law legalizing medical marijuana are calling on the state’s highest court to rein in the legislature’s power to amend measures passed at the ballot box. Steven Maxfield with The People's Right group said Monday the alterations undid much of what the voters wanted and are part of a troubling pattern of state leaders changing voter-approved laws. This group wants the court to overturn the changes and go back to original measure known as Proposition 2. Though the justices appeared skeptical about that, they did grill government lawyers about whether lawmakers went too far. Legislative attorney Eric Weeks says defended their actions, saying voter-approved laws are subject to being changed or repealed like any other law. The Vermont Senate has given final approval to a bill to tax and regulate retail sales of marijuana. The bill now goes to the House. People roll a marijuana joint. Retail sales would begin sometime in 2021. Sales would be restricted to people 21 and older. The Senate previously passed legislation to allow retail marijuana sales in 2016 and 2017, but both bills died in the House. Virginians with a doctor's recommendation soon will have access to CBD and THC-A oil dispensaries throughout the state. The Virginia Board of Pharmacy has approved five companies to open the dispensaries — one in each of the commonwealth's five health service areas. Each dispensary submitted an initial $10,000 application fee. The permit fee is $60,000 and a dispensary must pay an additional $10,000 per year to renew its license. Marijuana advocates have hopes that a proposal to legalize pot in Wisconsin has a better chance of success than ever given growing public support. Democratic state representative Melissa Sargent and other supporters on Thursday unveiled the latest proposal to fully legalize marijuana in Wisconsin. It comes after Democratic Governor Tony Evers called for legalizing medical marijuana and decriminalizing up to 25 grams of pot in his state budget. The biggest hurdle for supporters of any form of legalization is the Republican-controlled Legislature.